Tony’s aim in writing Educating Palates was to give day care centres and parents a simple tool to positively enhance the mental and physical development of their children. 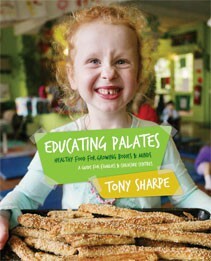 Not just a cookbook, Tony also gives tips for fussy eaters, lists healthier substitutes for common ingredients, shows which additives to avoid and suggests ways to positively engage children in healthier choices. Each recipe is written for both a family of four and a group of 30 children. Tony has a deep concern for the poor diets that some families and long day car centres are feeding our children. Obesity is on the increase and the use of preservatives and processed food is widespread. Educating Palates emphasises the use of whole foods which are high in fibre and low GI. These are easy and cheap to prepare recipes developed from Tony’s experience working with children over the last 20 years.